Scooter by the Sea: That's a lot of snow! That's a lot of snow! While weather forecasters are often wrong, or at best, close-but-no-cigar, the crowd of computer-model-watching geeks got it really right this time. They stated that the Blizzard of 2013 would break records, and up my way, it certainly did. In Portland, half a dozen miles to my east, the old record for a single storm was 27 inches - the city got 31.9 inches as of Sunday morning. Gorham, six miles west, received 32.9 inches. 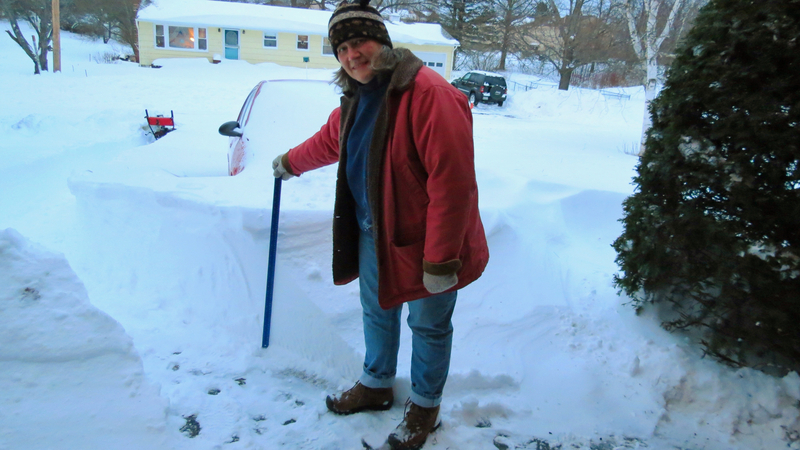 My dear wife Kathy holds a yardstick in our driveway, indicting 30 inches of snow. 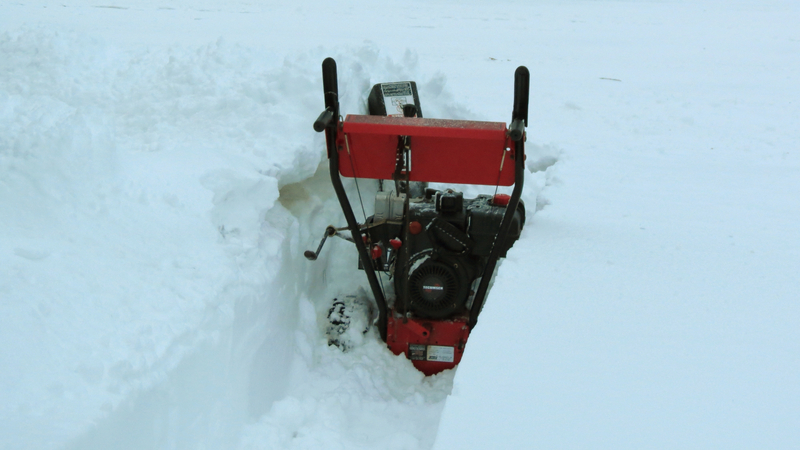 This has never happened to me - the snow was too deep for my snowblower to move! Tom, there's something very nice about record snowfall. I think Portland must have broken records going way, way back. 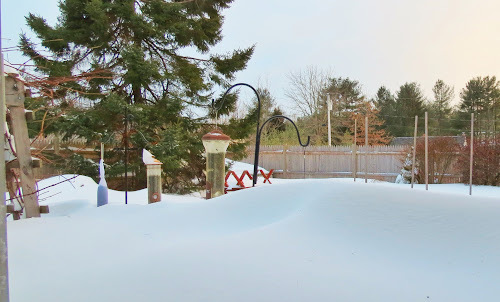 I spent the Storm of 2013 in Toronto where the storm also broke records, but nothing like Portland. I guess you'll have to dig out bit by bit. I hope you have enough food and fuel to wait it out. Food aplenty, bottled water, plenty of wood for the wood stove, and candles galore. But actually, while the blizzard set new records, it wasn't a huge deal. I rode around Portland today on my Vespa, and all main roads, as well as most side streets, were clear. Sidewalks were mostly unplowed, but there weren't that many people out. And Kathy and I cleared our driveway and the fire hydrant on our property in about an hour. Only problem was getting stuck with snow higher than the snowblower. All in all - not a bad week end to stay in and read. Wow. We were sure thinking of everyone during that storm. It is amazing how much snow fell in such a short amount of time and how high some of the drifts are. Shoveling show by hand is never easy when it is that deep and heavy, but I don't need to tell you that. Hopefully it will melt soon. It's melting already - nearly 40 degrees today, with bright sun. Tomorrow is supposed to bring warmer temps and rain. It did snow a lot, and it came down faster that I can remember - over two inches an hour, and winds blowing the snow sideways at times. Maybe a bigger snow blower? One of those monster sized ones? After I scolded my snowblower for slacking off, it did just fine. I hate to use strong language on a defenseless machine, but sometimes, you just gotta. And I was warm, mostly. My fingers tingled for a long while after the job was done, though. WOW THAT'S A WHOLE LOAD OF SNOW!! Thank you. 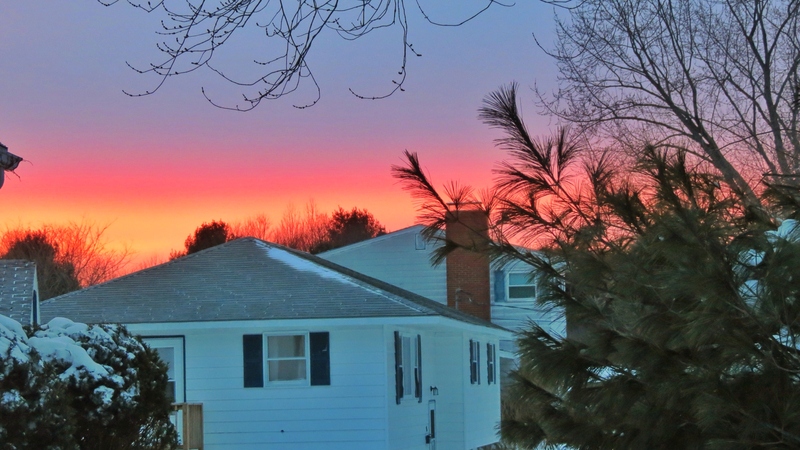 The old sailor's line applied here: "...red sky at night - sailor's delight!" Of course, you should look at my next post to see what happened on that predicted delightful day.